Money matters? Perspectives on Monetary Policy: Has Bernanke provided a helping hand to Draghi? In a previous post I stressed the tug of war between the Governing Council of the ECB and the money market: the former has a unanimous intention to keep the monetary policy stance constant or looser, the latter seems well poised to increase interest rates. In this tug of war, Bernanke has been seen by some as having started to pull on the ECB side with the utterly surprising Federal Open Market Committee (FOMC) decision not to "taper" the 85 billion of monthly purchases of bonds by the FED. 3. "...the rapid tightening of financial conditions in recent months could have the effect of slowing growth, ...". A critical observer could read the FOMC motivation as evidence that it got scared of itself. Indeed the first of Bernanke´s motivations, uncertainty about the strength of the US economy, does not look very convincing, given that the FOMC conceded that: “the Committee sees the improvement in economic activity and labor market conditions since it began its asset purchase program a year ago as consistent with growing underlying strength in the broader economy". The force of the second motivation is put in doubt by observing that it is not clear that the uncertainty about the impact on the economy of the budgetary fights between Congress and the President is more significant now than it was in June, on the occasion of the tapering announcement. Then one is left with the third motivation, higher rates, as the dominant factor in the decision of the FOMC not to taper. But the higher rates have just been the consequence of the tapering announcement, and one is left with the unpleasant conclusion that the FED got afraid of the consequences of its own announcement in June. According to this interpretation, the bar for the FED to exit from its über loose policy has been raised substantially: if the consequences of a tapering announcement, as cautious as that provided by the FED in June, cannot be tolerated even when there is "growing underlying strength in the broader economy" notwithstanding the negative fiscal impulse, when will it be possible to reduce the speed of purchases? Whatever the reason of the FOMC decision not to taper, what are the consequences on the other side of the Atlantic? Does the decision to postpone tapering really help the ECB in imposing its view of a constant or easier monetary policy stance on a reluctant market? 3. And, in Draghis´s words, "Recent developments in global money and financial market conditions and related uncertainties may have the potential to negatively affect economic conditions ", that clearly referred to the June tapering announcement by the FED. So, it was the ECB, before the FED, that disliked the rate increase that followed the June tapering announcement and should welcome its postponement. Where r is the relevant interest rate and x is the foreign exchange, while α and β are two parameters to be determined empirically. By inserting in the formula appropriate parameters and the changes in the interest rate and exchange rate following the FOMC non-tapering announcement on September 18th, we can measure whether indeed monetary conditions in the €-area have become looser. For the parameters we can use the 6 to 1 ratio for the interest rate and the exchange rate respectively, estimated by the European Commission . For comparison purposes we can also look at the 0.7 - 0.3 weights of L. Ball, which give much more importance to the exchange rate relative to the interest rates as he calibrated them for medium sized economies and not for an economy as large as the €-area. These results show that, once one takes into account the appreciation of the €, the FOMC non-tapering did not help the Governing Council of the ECB in avoiding a tightening of monetary conditions, which runs against its stated intention. Indeed, overall monetary conditions tightened, reinforcing the trend that has taken place since the ECB has issued its forward guidance. So, if the Governing Council wants to win its tug of war with the market it cannot count on transatlantic help and must rely on its own action. Will it do it? The MCI is calculated by the European Commission as a weighted average of the real short-term interest rate and the real effective exchange rate relative to their value in a base period. 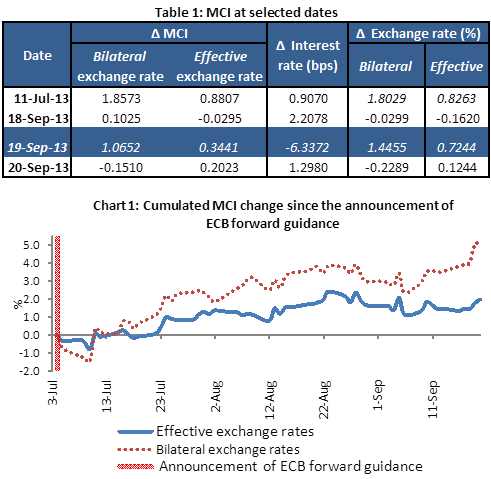 In DG ECFIN’s MCI, the relative weights of the interest rate and the exchange rate component are 6:1. These weights reflect each variable’s relative impact on GDP after two years and are derived from simulations in the OECD’s Interlink model.